Darcy burned with the pain of knowing she’d failed. What happened when a prophecy didn’t come true? It must not have been much of a prophecy in the first place. And if they couldn’t trust in that, then they couldn’t trust in anything at all. Thrust back into Alitheia through unexpected means, Darcy winds up alone, scared, and without her recent memory. As she struggles to reunite with the ones she loves, she pieces together the prophecies and the oracles to find they all converge into one story — a story that tells her just how much she’ll have to give to save both worlds, and everyone she loves. Pursued through Alitheia by forces desperate to kill them, Darcy and her friends take a journey fraught with danger that will lead them, inevitably, to the final confrontation with the Shadow. And, ultimately, the greatest courage of all belongs not to those who give something of themselves, but to those who let go of what they could never control. The ability to create characters, worlds, and stories so dynamic they elicit powerful emotional responses and long-lasting attachments years after encountering them is incredibly rare. K.B. Hoyle happens to have this ability in spades. What began as a nobby-kneed, petty, disjointed group of pre-teens is now a tightly-interwoven team of mature adults with a deep commitment to one another and to this “stupid-hard” job they are tasked with. Growing with these characters over the series in such an organic fashion makes The Gateway Chronicles impossibly real to me and other readers, which makes the finality of this final release of the series such a painful thing. I, like Darcy, must learn how to say goodbye. And what a fulfilling, lovely goodbye it is. The Bone Whistle is, above all else, a completion. That may sound redundant given the fact it’s the last of the series, but completion means so much more within the realm of The Gateway Chronicles. It is the coming together of every seemingly disjointed prophesy, oracle, and major life event to form one grand conclusion in the very center of her web. Beyond the craftsmanship itself, there is a completion found within the marriage of Darcy and Tellius, with Darcy’s powers and citizenship, and with her final sacrifice. Darcy is a singular character in the series, and a fitting focal point from start to finish. She is fully realized both literally and metaphorically by the time she faces Tselloch and prepares to meet her end, yet to her very last breath she does not give up the good fight. Armed with wisdom, a deep thread of compassion, and plenty of courage, Darcy goes to face the death she’s known was coming since her second year in Alitheia, yet still she tries to save the one person who’s given her no reason to care; Colin Mackaby. I’ve touched on their relationship before, but everything truly comes to a head in this novel between Darcy and Colin. To him, she is unattainable salvation wrapped in a pretty package sent to mock him with her empathy and repeated attempts to show him a better path. To her, he is a wounded creature in need of care, a cause not yet lost. The decisions they make in relation to one another, and the reasons behind their actions, end up completely changing the narrative as we know it. Darcy’s relationships have always affected pivotal change on the course of things, yet they escalate to an entirely different level here. It is the first book in which we get to see Darcy and Tellius working side-by-side not only as friends, but as spouses, equal life partners figuring out their brand new marriage while desperately seeking a solution to the pending destruction of their beloved world. In this, the readers get some of the most beautiful, heart-wrenching material as we follow the thread of their interwoven lives, and their grief over the promised early loss of that very existence. This grief is not, however, Darcy and Tellius’s alone to bear. Sam, Amelia, Perry, Lewis, and Dean must all find some way to say goodbye not only to their friend and leader, but to this world they’ve devoted five full years of their lives to. Readers have known from the beginning that each of The Six had a role to fulfill in order for the shadow to be vanquished and the gateways to be closed. 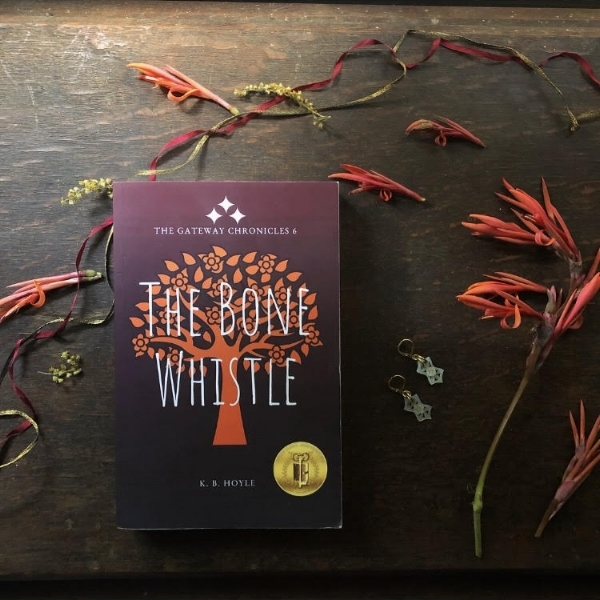 Over the course of the novels each character has popped up here or there to lend their special talents, yet never before have we seen them fulfilled quite like they are in The Bone Whistle. These passionate, unique characters jump into their given purposes with trepidation turned delight, and their final performances are legendary. Legendary, because each and every action within this novel—within this series—is fully motivated by love. Love is the key to all of this. The characters’ love for one another and for the magical world, the readers’ love for the story, Pateros’s love for his creation. My favorite line of the entire series comes here as well, one that encompasses the theme of the entire series. “There is no greater exchange, no more powerful magic, than to give of one’s life so others may live.” Love, exchange, sacrifice. These are the elements and themes that, coupled with the characters and plot, will secure this series in my heart and the hearts of other readers for decades to come.